Sun, Moon, Mars, and Mercury are all in Taurus, the Bull. that if the new moon in Taurus follows the full moon (Wesak), then that which infused Humanity at Wesak has been given the opportunity to deeply embed within Humanity’s collective consciousness. that the dark of the Moon represents a particular veiled potency within the Light of Enlightenment. Decoding this full thought: Wesak and the Taurus full moon are when the Buddha chose to express enlightenment indicating that the fullest expression of Taurus is “thine eye single” thereby “all is illumined.” But to accomplish this Gautauma sat and persevered (fixed sign) in austerity and abstraction. The latter was to disengage from and thereby understand the nature of desire and its progeny (represented by common Taurus). However, the new moon infers a deeper matrix of cause-result than the one brilliantly given by Buddha (chasing desire creates a perpetual wheel of chasing). The darkness of the new moon signals “the womb with no exit” that Awareness actually is. In other words, out of the very matters of self is the raging light of enlightenment born. From one’s own nature the pure Ground of Being is experienced and thus the full sumptuous delight of Existence as Awareness is lived and known. Taurus symbolizes the constitutional nature that is the manifest expression of Awareness-Being. Taurus represents the desire nature that seeking the touch of the sumptuous looks outside of innate Being. Then desire distracts us and then refines us. In the process we repulse the external and then blossom into Awareness-Being. Taurus, its eye single, is Samantabhadra’s view of supreme profound every day emptiness. And Taurus is the throat, the Word made Flesh, and the flesh that we devour in search of satiety until we realize that compassion gives and does not take. The Sacred Bull is the Sacred Cow is the womb with no exit is Humanity’s realization of purpose. 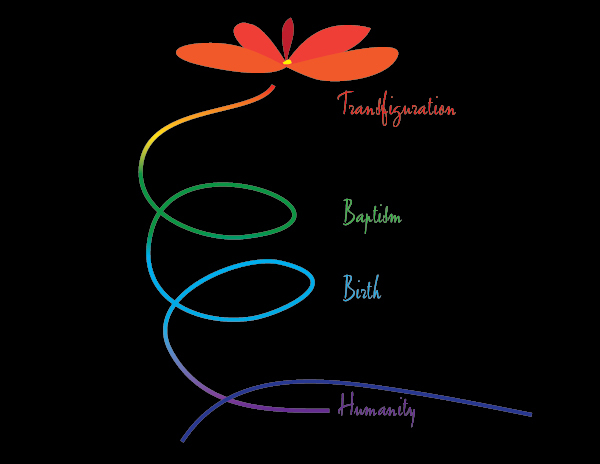 The new moon in Taurus offers humanity alignment of “the great triplicity of desire, aspiration, and direction (EA pg. 371) especially while Mars is conjunct the Sun. You probably have been feeling this conjunction through May/June. Directedness calls from inner authenticity, “What am I doing and why am I doing it?” Aspiration has been calling us to a truer sense of purpose and functionality. And yet, the habits of desire, enacted usually through distraction and low vibration living have also exerted themselves. Mars is all of these and with it conjunct the Sun, we are irritable with ourself and the slow pace of change (bull) and also frustrated with our lack of harnessed motivation and accomplishment (yoked desire, focused eye of directedness). Add Mercury to the mix and we have perfect ingredients for new awareness, new direction, new sense of truth, and awareness of our personal untruths. Mercury is the range of awareness used for uprightness or for deviance. Mercury is the trickster, Mara, just as Mercury is Thoth, Hermes Trismegestus, Manjushri and the great Wisdom beingness within. Mercury, in its range, is represented by the final test of Buddha’s resolve for unmitigated supreme understandings as he realized that Mara is himself. This is humanity’s ongoing awakening: there is no one to blame because we are only ourself. In other words, divided by blame and finger pointing, we are distracted and disempowered as a collective. But the truth of Being is that there is no self, there are no “others”, there is only Life and every expression of Life is the one Life. The throat center includes the gullet. 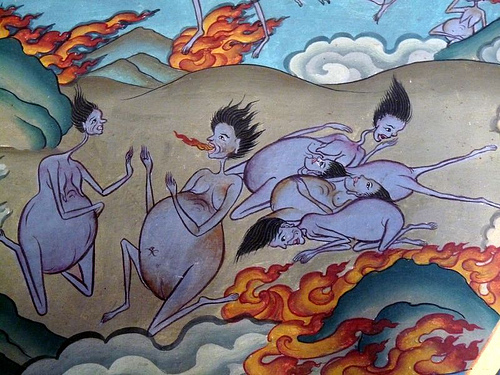 Classic Tibetan imagery give us the image of the hungry ghosts: pencil-necked insatiable beings who, as people, fed desires and but did not nourish themselves or others. They took and did not give. Humanity lives this. As the planetary throat center, we are the latest experiment in learning what truly sustains and truly lastingly nourishes the purposes of Being. 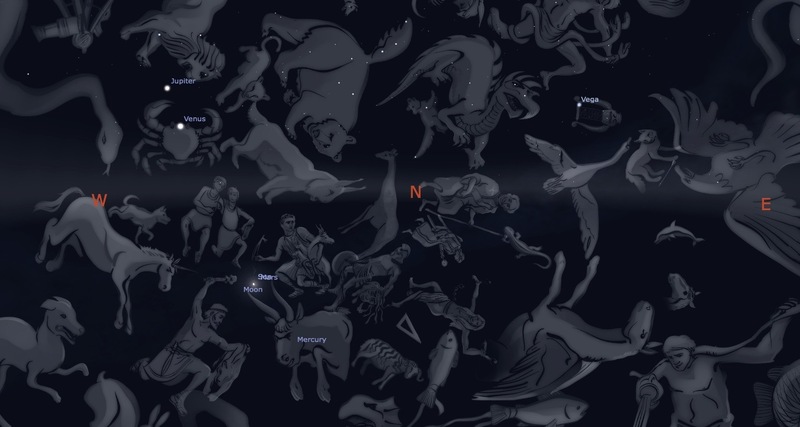 Which brings us back to the new Moon in Taurus and its conjunctions. This short multi-day cycle offers truth of Being. Use Mars as the Sword of Insight by aligning the “single eye”(Mercury) in meditation. Then use Mars as to lift up from the lower centers which it rules to its higher maturation within the “single eye” of ajna. Gain direction through insight (Mars/Mercury). And then harness desire such that it is transformed into aspiration and dedication (Sun/Mars). Then engage the womb with no exit of life because Awareness is no where but here, and enlightenment is as one lives it. This entry was posted in Astrology, Esoteric psychology and tagged ageless wisdom, Alice Bailey, astrology, awareness, Being, beingness, Buddha, Buddha-nature, compassion, consciousness, enlightenment, esoteric astrology. Bookmark the permalink.